METTLER TOLEDO XPR precision balances’ clever mix of features delivers fast, stable results and safely records them for error-free data transfer and air-tight traceability. A focus on ergonomics makes these workhorses comfortable to use, while a robust design protects them from overload as well as harsh chemicals, dust and dirt to promote long life. METTLER TOLEDO XPR precision balances are helping busy labs and manufacturing operations create simplified workflows while maintaining accuracy. In today’s business world, organizations are constantly under pressure to implement solutions that increase quality and decrease lead time. METTLER TOLEDO XPR precision balances are helping busy labs and manufacturing operations create simplified workflows while maintaining accuracy. Proven technology. Along with the latest high-performance sensors, SmartPanTM eliminates air turbulence effects. Stabilization is improved and results are delivered up to twice as fast as a standard weighing pan. Users gain the highest accuracy possible in just about any environment – including a fume hood or safety cabinet. Error-free data transfer. Manual reporting becomes a thing of the past. Task parameters and results displayed on the integrated notepad can be quickly transferred to PC via USB or Ethernet. This eliminates transcription errors and streamlines processes. A focus on ergonomics. Lab work is often repetitive. Every detail on the XPR has been thought out to provide the most comfortable weighing experience available. Large display figures are easy to read so eyes stay fresh. The addition of ErgoStandTM allows standing operators to mount the screen at eye-level to reduce neck strain. Clean, safe and streamlined. Integrated overload protection safeguards the weighing cell. Protection covers combined with a full metal housing protect the XPR against dust, dirt, splashing liquids and harsh chemicals. Smooth surfaces make the entire balance easy to clean for a further reduction in time spent on weighing protocols. Overall, these features streamline daily tasks and help to improve measurement quality to ensure accuracy in all analyses and meet internal and external client demands. 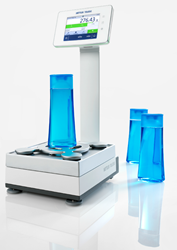 Learn more about how XPR precision balances can help create significant gains in weighing workflows today.